It was an average Thursday evening in the summer of 2012 and Alex had been talking about buying a van to take his family around Perth (where we were living at the time) during their upcoming visit to Australia. It wasn’t until he picked Michaela up to go out for dinner in the most bizarre looking van that she actually realised he was serious about it. This is the first photo we took of Vanda – way back in 2012! It was our third anniversary and Alex had wanted to impress by secretly buying the van and chauffeuring Michaela in ‘style’ to a dinner-date. Impress isn’t the word you might have used and, to be very honest Micahela didn’t think that highly of the van at all. It looked like a dark green toaster on wheels and, to Alex’s dismay, only hesitantly did she get on board. Over the next three years however, Michaela’s opinion of the van slowly changed into astonishment, contentment and then finally pride. The van was incredibly comfortable on the inside, extremely useful for moving house, taking loads of people around, pulling a boat and best of all, it was four wheel drive! She never ceased to impress us. Vanda got through this sandy pit with ease, while the top of the line Range Rover behind us got severely bogged. As our love for her grew, we tenderly named our new baby ‘Vanda’ after Alex’s grandma (and of course because of the obvious van pun). Vanda had become a part of our family. She went everywhere with us and although we already had adventurous spirits, she inspired us to go further and plan bigger and better adventures. We looked forward to travelling in her and organised countless trips around Western Australia. At the same time however, life starting to get hectic… We both worked 8am-5pm office jobs on top of managing our own business, renovating our house, filming and editing videos, planning our wedding and maintaining a relatively sane social and family life. As much as working a regular office job is convenient, we weren’t happy and our plans for life were always more than taking the ‘easy road’. We wanted to explore, meet new friends, build alternative careers that would make us happy and most of all, see the entire world. Vanda took pride of place as our wedding car. After our wedding, Vanda finally inspired us to take the plunge – to commit to our dreams, leave everything behind and travel the world… by car!! As Alex had always wanted to take Vanda home to Brazil, we thought what better excuse was there than to drive her there (and maybe just see the rest of the world on the way)? 1. We wrote a list of countries that intrigued us and over the following 2.5 years we researched shipping, roads, visas, safety and cultures until our eyes blurred. From this knowledge and through talking to other travellers we finally set a draft itinerary (online forums, blogs and Facebook groups helped a lot). This got us even more excited and we finally committed to the trip by creating a high interest savings account and starting to live frugally. 2. We set a very low weekly budget and saved every single cent we didn’t use for two years. This meant we had to find free and cheap fun things to do instead of eating out at expensive restaurants or paying for pricey outings. The funny thing was we actually found many things to do that we enjoyed just as much, if not more than the pricier activities we had been doing! 3. As we lived frugally we slowly built a camper set up in our Delica including a bed, wardrobe, desk, storage, kitchen, solar panel, spare fuel tank, spare wheel carrier and a 70L water tank. We built everything with our own four hands and the help of Michaela’s dad. 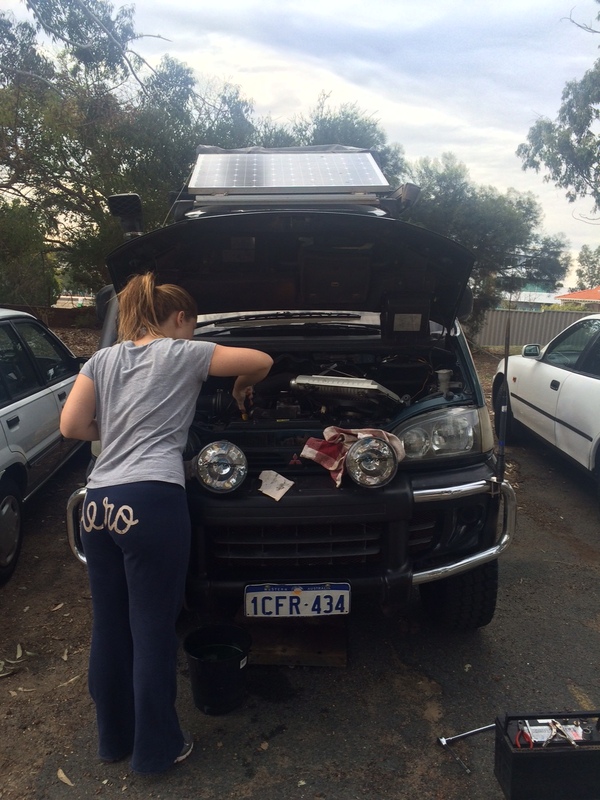 We wanted to put as much of the money we were saving into actual travelling, so we learnt how to weld, sew and be mechanics and carpenters in order to do so. 4. 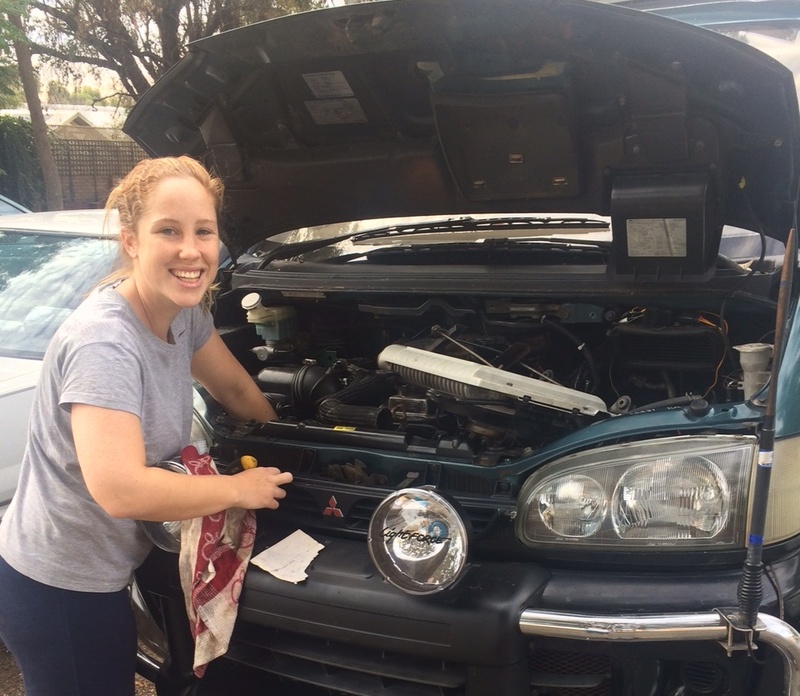 We also worked extra jobs wherever we could – Alex serviced friends cars in the backyard and Michaela filmed weddings and events to top up the coffers. 6. We changed our mortgage to interest only and rented out our apartment, moving in with Michaela’s brother and partner for the final 6 months before our departure. We slowly sold and gave away all our belongings and assets – we only kept what we’d need for the trip and a few small boxes of sentimental belongings that we left with our parents. 7. We met with and talked to dozens of other overlanders to get planning /travel tips and to design a budget for the journey. What we heard was that US$100 a day is a reasonable budget that includes all costs for two people to drive around the world (shipping and relocation costs included). We decided to drop this number to Australian $100 (US$75) a day and try to stay under this. That means for a three year long trip we’d need something like AU$100,000!!! 8. Unfortunately even with working extra and building our set-up ourselves we knew we wouldn’t have that sort of money. So we resigned ourselves to the fact that we’d need to work (whether doing ski seasons, wedding films or trying to make money online) during the trip. We look at this as more of an opportunity than a hindrance though! So two and a half years of planning, building, convincing and dreaming later, and here we are… living our dream of exploring the entire world and showing everyone it is possible – even with a small budget. We’ve got AUD $80,000 behind us and are determined to make it all the way around the globe with what we have! We’d love you to come along on the journey with us, both by reading our blog posts, watching our films and even by meeting us somewhere along the way. Our goal is to meet as many of you as we can, hear your stories, taste your food, learn your culture and in this way, greet the entire world!